Tired of dealing with sleep problems? You are not alone. Insomnia, which refers to difficulty falling asleep and or waking up too early, affects millions of Americans. The Centers for Disease Control calls it a public health crisis with an estimated 50-70 million Americans suffering some sort of sleep or wakefulness disorder (CDC) that places people at higher risk of accidents and of diseases like hypertension and depression. At the Carlton NeuroFeedback Center, we specialize in neurofeedback training to help you return to normal patterns of sleep without medications. Insomnia is a disorder that makesit difficult to fall asleep, stay asleep, or both. Sleep is crucial to overall good health. Sleep provides the brain a necessary opportunity to sort and prioritize all that has transpired during the day and for immune function. Moreover, mental functioning and physical performance decreases substantially with inadequate sleep and places individuals at risk for a variety of illnesses. It can cause long-standing fatigue, problems with concentration, moodiness and irritability, and difficulties with relationships. According to the National Sleep Foundation, most adults should get between seven and nine hours of sleep every night. Chronic insomnia may be caused by a problem with the brain being unable to shut off its wake cycle and transition into sleep mode. It may be exacerbated by physical and/or emotional stress on the body and brain. These stressors in turn further cause brain waves to react in unbalanced ways. Can neurofeedback training help remedy insomnia? Absolutely. Fortunately, today’s technology enables us to measure and observe these brainwave imbalances. This tool is called brain mapping and it can be used to analyze brain function that is contributing to sleep issues. Once an individual’s pattern is identified, neurofeedback can be utilized to retrain brain waves to enable the central nervous system to transition smoothly from an awakened state to sleep. Neurofeedback training aids in restoring natural sleep rhythms. Research shows neurofeedback to be a powerful tool in helping insomniacs learn to fall asleep and stay asleep throughout the night. Some 1800 certified neurofeeedback providerswho utilize neurofeedback training to treat insomnia report excellent results. Even better, it is drug-free, pain-free, and non-invasive. That means there’s no risk of side effects and the results are long-lasting. Give us a call at the Carlton NeuroFeedback Center and let us help you get a good night’s sleep once and for all. We offer free initial evaluations to see if neurofeedback might be right for your situation. See what makes our clinic unique and what patients tell us after receiving treatment. We look forward to helping you unlock your brain’s healing potential. Want to learn more? 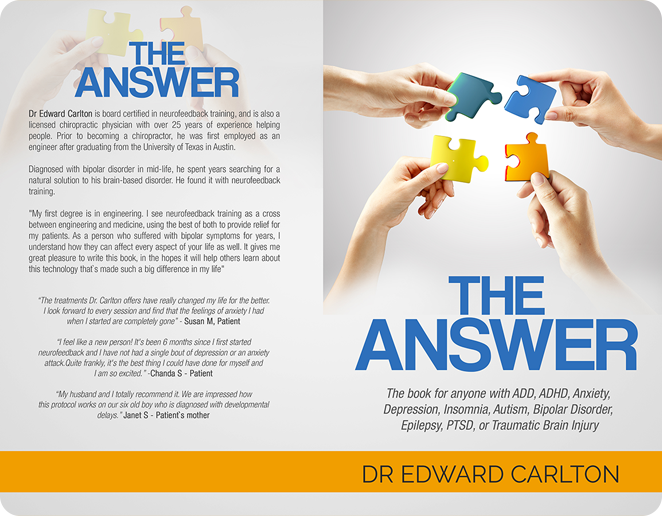 Download Dr Carlton’s Ebook.